"In Hard Time, you do hard time as a character that has just been thrown into prison." In Hard Time, you do hard time as a random guy who has just been thrown into prison for what ever reason it may be. What ever the reason, you are in prison and you control a guy and build a reputation in the joint. When you initially make a character, you can just choose a generic character (there is an option just to create a random one with a random name) or you can customize your character how ever you want and name him what ever you want. But, that is entirely up to you and this changes nothing in the game other than personalize the character for you. The objective of Hard Time game is to build a reputation in prison at what ever cost. 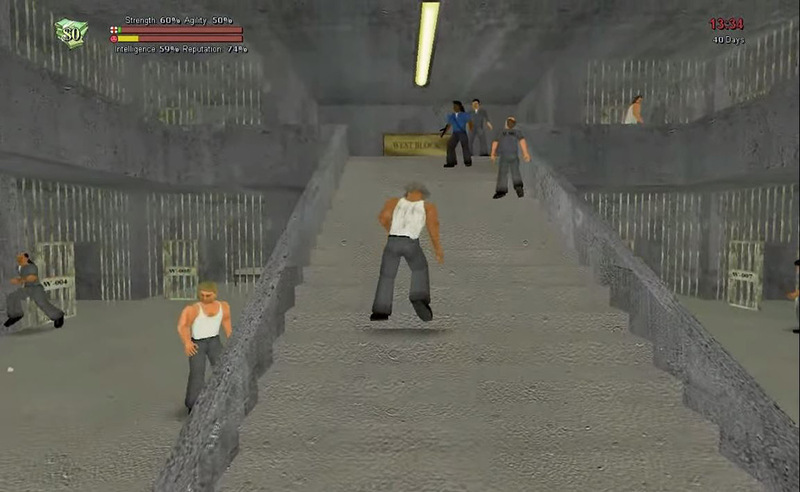 You are to run around and interact with other prisoners in the prison that you are in. You get to exercise, fight, and work. You earn money by working in prison, and you are able to make friends by doing this as well. The choices you make in the game will ultimately effect your standing with other prisoners, while also effecting your health and your strength - all of which is very important when it comes to being successful in Hard Time. The game controls of this Prison sim game are pretty simple to get the hang of and are explained to you initially. The graphics are sort of poor by today's standards, but the developers were clearly not interested in making the game look too realistic. The game is pretty simple and easy to get the hang off, and is a fun time burning video game if you are looking for something while you are bored.